HEKARI’s Raymond Gunemba scored a hat-trick to deny Gigira Laitepo Morobe FC a National Soccer League grand final spot with a 3-0 victory at Sir John Guise stadium in Port Moresby on Saturday. Gunemba may have also set a new NSL record by scoring at the 24th second, a quickest goal in the history of the competition. The win for Hekari now means they will appear in a record, six consecutive grand final. They have won all the grand finals since the inception of the competition in 2006. Playing alongside Solomon Islander Joachim Waroi, the former Gigira Laitepo Morobe forward did not show any mercy against his former teammates by scoring three outstanding goals. The Morobean made his intention known in the 24th seconds when he powered home the first goal for Hekari to lead 1-0. Gunemba made use of the unsettled Morobe defence to quickly score the first point. 16 minutes later, he beat the Morobe off-side play to put Hekari in front by two. However, Gunemba’s goal was disputed by Morobe team management who had halted the game for 20 minutes. After negotiations, Morobe agreed to have the game continue with Hekari taking the lead 2-0 lead at the break. In the second half, Hekari came back strongly to defend the lead. Skipper David Muta and Wira Wama stepped up in midfield to launch raid into Morobe territory. Muta and Wama were class above the rest of the players with their clever passes and footwork which made their opposition guessing most of the time when they had the ball. In one of their moves, Muta passed the ball onto Wama who beat the off-side trap to put Gunemba through who kicked the ball over Gigira goalkeeper Francis Warisan for the three-goal haul for the afternoon. NSL Match Commissioner Saki Nonis said Gunemba’s 24 seconds goal may be the quickest goal in the short history of NSL because he had no record of any quick goals for the competition. 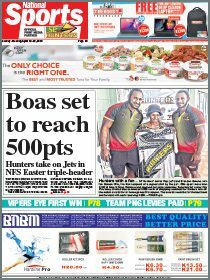 Meanwhile, Port Moresby FC denied Besta PNG United’s grandfinal spot with a 2-0 semi-final victory at Sir Ignatius Kilage stadium in Lae on Saturday. The game played in front of a capacity crowd was a display of class as both team fought to secure the final spot. Besta United, with the home crowd rallying behind them, started the match strongly with their forward’s Jamaal Seeto, Tommy Sammy and Jonah Philip bombarding POM FC’s goal mouth. The visitors sensing the strong presence of the development side in their territory began to change the game plan that resulted in a goal through their midfielder Max Sengum who belted the ball pass Benjamin Wilbert for a 1-0 lead. The second goal for the visitors was scored by Vanya Malagian at the 53rd minute from a penalty kick to expand the lead to 2-0. 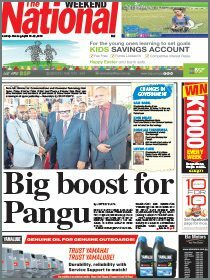 Hekari will now play FC Port Moresby in the grand final while Gigira Laitepo Morobe face an all-Morobe affair when they take on Besta PNG United team for the third and fourth placing in 2013 NSL season.